Bryan Stevenson has written a painful and powerful book, Just Mercy, chronicling his creation of the Equal Justice Initiative and his (and others’) fight for justice and redemption. The PRA Cultural Competence Committee selected this book for our Spring Book Club. The consensus after our book club discussion was that we were all grateful to have read it, but that it was incredibly difficult to read. I found myself reacting with very strong emotions. Mostly deep sadness, boiling anger, and at times a little bit of hope. During our PRA Book Club discussion, we challenged the group and asked them what they were doing to still “throw stones.” We discussed a recent exercise that we had all completed for a cultural competence project, where we took implicit bias tests and reflected on what that means and what we can do to prevent micro-aggressions in our own daily actions. We also discussed the work that we are doing at PRA to serve as stonecatchers. It is wrapped up in our mission and every one of our projects. From trauma trainings and crisis intervention training (CIT) with law enforcement, multiple projects to improve connections to behavioral health services for justice-involved persons and Veterans, systems-change work in the juvenile justice system, including school safety and Raise the Age, to the recovery supports of wellness and benefits. The newsletter for the SAMHSA’s GAINS Center for Behavioral Health and Justice Transformation has also been featuring articles about racial and ethnic disparities. To expand on these existing efforts we made a commitment as a group to explicitly mention the impact of historical trauma as an important factor in everything that we do. There were many examples of injustice in the book where we can point to specific efforts that PRA is involved in that can help to improve or prevent those scenarios in the future. 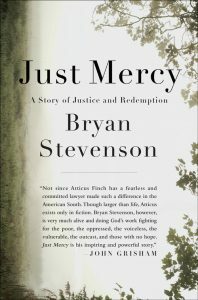 Stevenson wrote about a correctional officer in a prison in Alabama whose truck was in the parking lot. The truck was “covered with disturbing bumper stickers, Confederate flag decals, and other troubling images.” The officer gave Stevenson quite a hard time and subjected him to an invasive search. Later, that same officer attended the hearings for the defendant that Stevenson had gone to visit and heard about the trauma that the defendant had experienced. He related to that trauma as he had a similarly tough time in the foster care system. He seemed to soften after having listened to the expert testimony and treated Stevenson and the defendant with more compassion and care. During our book club discussion, Melissa shared a story about a probation officer, a man of color, who had been to the PRA trauma training, “How Being Trauma-Informed Improves Criminal Justice System Responses”, and was supervising a person who was a self-proclaimed white supremacist. The officer experienced explicit racist behavior from the person under his supervision and called the man in for one last meeting prior to revoking his probation. Using the approaches learned during the training, the officer was able to engage in meaningful dialogue with the person, learn more about the trauma he had experienced, and make progress with the individual. Stevenson wrote about his days in Atlanta, and I couldn’t help but be brought back to my first job out of graduate school. I was working as a Client Advocate at the Georgia Law Center for the Homeless. We didn’t deal with high-profile death penalty cases, but we did solve civil legal challenges that people were facing. Sometimes our effort to help them obtain a birth certificate when they have absolutely no form of ID, or assisting them with the Social Security disability application, or helping with a Wage Claim from an employer who hadn’t paid them for their hard work seemed small, but we were changing that person’s life and in some cases transforming their experience and ending their homelessness. At PRA, I have had the privilege to continue working on ensuring eligible people are able to access the benefits they deserve that can help transform their lives, but there is so much more that my colleagues at PRA are doing to help change the criminal justice landscape. Even though there is much work to be done, the work of the Equal Justice Initiative gives me hope and the work of PRA gives me hope.